I was such a Strawberry Shortcake kind of kid that I even dressed up as Strawberry herself one Halloween. It was the cheapest, most plastic-y costume you could possibly imagine, but I cherished that thing. But aside from what I remember about that sheet of plastic costume, what I loved best about Strawberry Shortcake was her intoxicating smell. They say it was Strawberry, but I'm not sure it wasn't crack. Since I was such a Strawberry Shortcake fan as a kid, I was thrilled to see her make a massive come back this year. I'm getting a kick out of watching Little L and C play with my little fruity friends. I have two girls so it almost goes without saying that they go ballistic whenever I present them with a toy that has lots of tiny components. Anything cute, pink, and tiny is an instant hit in our home. My husband goes ballistic also, but for completely different reasons. The tiny bits drive him up the wall. 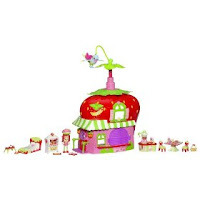 The Strawberry Shortcake Berry Café is exactly the kind of toy my girls love. It's adorable, comes with a doll, and lots of teeny tiny pieces for lots of fun pretend play. Little L likes that Strawberry can sit on a bird and go for a spin. C likes to set up the café and have Strawberry be the perfect little hostess. I like watching them take a trip to my childhood. And M? Well, he's not a fan of the little pieces, but he does like it when the girls play on their own. - Fun retro toy with an up to date twist. Lots of fun details, like a blender for iced coffee drinks and a cute little oven to bake the tiny baked goods. Strawberry Shortcake even has a bed in case she needs to take a nap after a particularly crazy morning! - Not a bad price point for such a large toy - $28.42 today on Amazon. - Great potential for imaginative play. 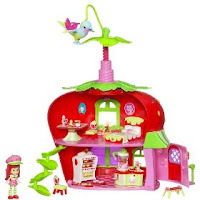 Since Strawberry Shortcake is the only doll supplied with this set she might have to get to know some of your kid's other dolls! - I don't know if my kids are singular in this or not, but they don't tend towards mixing and matching their toys. So there's a big chance that in our home Strawberry won't be making any friends until her creators start selling more of her fruity palls. - The windows and doors on the café don't seal shut so the tiny little pieces can't be stored in it for safekeeping. A ziplock bag takes care of that issue, but it would have been nice to have the set be self-sufficient. - My treasured childhood smell isn't here for the ride. (It is on some of the Strawbery Shortcake coloring books that we have found.) But the girls don't mind. I'm the only one who noticed! All in all this is a lovely toy and will make many little girls grin with glee this holiday season! Please Note: I am in no way affiliated with Hasbro. I was given a Strawberry Shortcake Berry Cafe for review purposes and was in no other way compensated for this review. The opinions and thoughts expressed in this post are mine and mine alone.